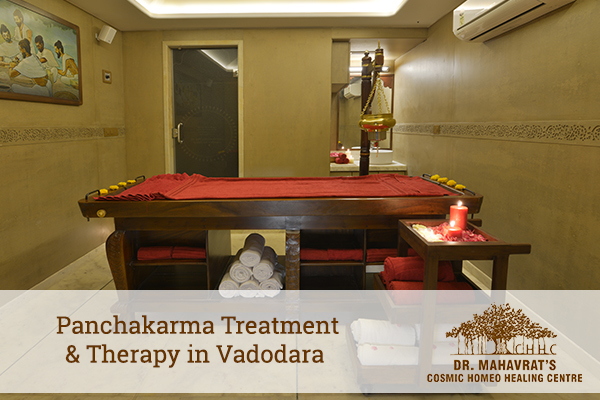 Looking for the best panchakarma treatment in Vadodara? Then you need not worry at all since there are a number of clinics in Vadodara where you can expect premium quality treatment without giving you a single chance to complain. 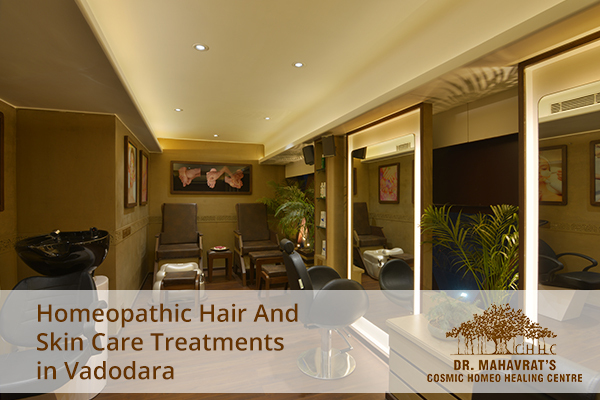 Among them, Dr. Mahavrat Patel’ clinic would be your ideal destination in this regard. We have to admit it that our life in today’s world has become extremely fast paced which is the main reason as to why a lot of people are facing a number of problems regarding the body posture and the physical health. This is turn is leading to some of the persistent issues occurring in the lower back, slipped disc, herniated disc, obesity and some others as well which are emerging. The panchakarma treatment works ideally with the help different types of medicated oils which helps in the elimination of impurities from the body of human beings thereby detoxifying the body. There are five general panchakarma therapies conducted which are as follows. If you are hesitating to go for the panchakarma therapy, then it would be a great idea to go for it owing to the number of advantages which you can get from the treatment. Now, it is quite clear as to how beneficial is the panchakarma therapy for the human body. So, do not waste anymore time and go for the therapy to enjoy the benefits. The evolution of homeopathy in India is certainly commendable and with the passage of time, the evolution is taking place at a rapid pace. The homeopathic treatment with its phenomenal track record of effective utility and safety is all set to be not only the future of medicine but also extremely useful in preventative healthcare at the same time. With the increasing popularity of homeopathy treatment in India, this procedure of treatment has been emerging out to be the one of the most preferred options for treatment in the country. Dr. Mahavrat Patel’s Homeopathy Clinic in Vadodara is one of the top examples in this regard which stands as a great proof for a real success story of homeopathy in India. At our homeopathy clinic in Vadodara, we have a proven track record of a huge number of success stories of homeopathic treatment offered to patients. 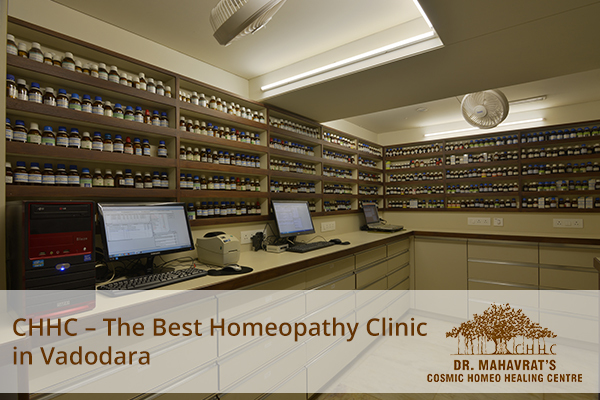 With the top quality homeopathic treatment under the guidance of the expert homeopath Dr. Mahavrat Patel, the clinic has emerged to be one of the premier homeopathy centres not only Vadodara but also in the whole country. 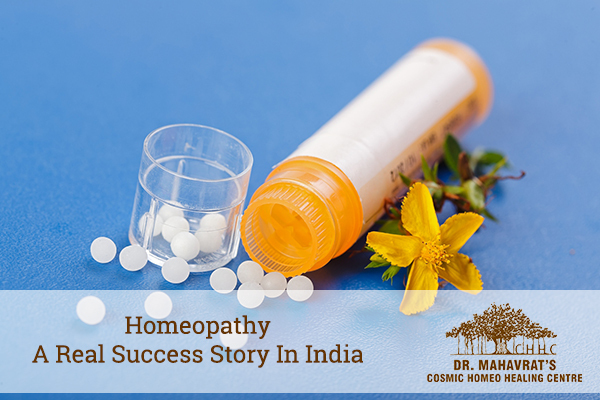 To make it even more clearer, it would not be very incorrect to say that, homeopathy is certainly a real success story in India. 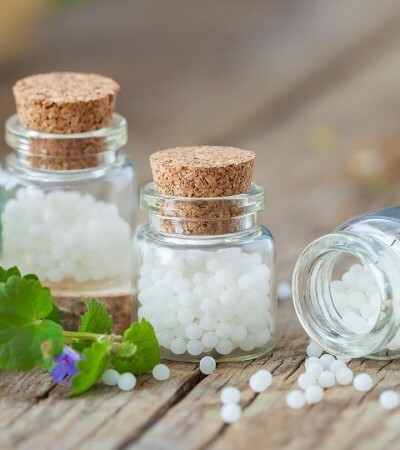 Homeopathic treatment has become one of the trusted forms of treatment in the country with a rapidly increasing number of patients opting for the same. There are a number of reasons why this form of treatment is being readily preferred. Homeopathic treatment is basically a system of alternate medicine which makes use of natural substances for the cure and treatment of the symptoms as well as the diseases. Homeopathy never ever tries to suppress the symptoms and the conditions for giving it a temporary cure. Instead it always focuses on the elimination of the root cause of the disease and tries to give a cure from deep inside thereby providing a permanent solution. In our country India, there are about 23 institutes which come under the Council for Research in Homeopathy or CCRH which proves how fast is homeopathy treatment in India evolving. For a more validated proof of the success story of homeopathy in the country, you can consider the fact of the increasing number of people going for homeopathic treatment. 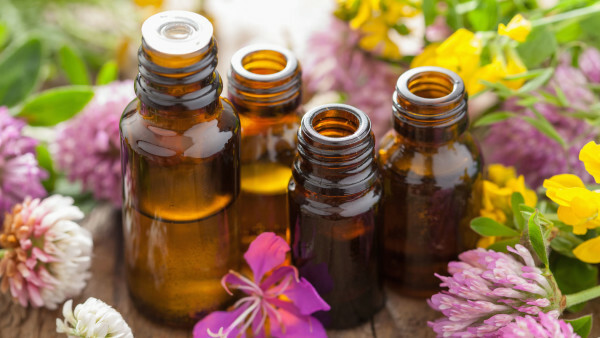 You might be surprised to know but it is true that there is about 50 percent more footfall of patients who are seeking homeopathic treatment in the last fiver years of time. So, now there is no confusion regarding the phenomenal success and evolution of homeopathic treatment in the country. Bronchitis is a swelling or inflammation of the bronchial tubes, the air passages between the mouth and nose and the lungs. Bronchitis often occurs during the cold and wet seasons and is usually coupled with an upper respiratory infection. Here is some information about acute bronchitis and chronic bronchitis with causes, symptoms, diagnosis. It is the swelling of the bronchi usually followed by upper respiratory infection. 90% of the cases are caused due to infections which are responsible for coryza and cold. Chronic bronchitis does not have a sudden rush and is frequently caused by long-term and repeated irritation of the bronchial tubes. Irritated and inflamed bronchial tubes are more prone to be infected. If symptoms continue more than three months or longer than it is considered a chronic bronchitis case. Allergies cause it can also be classified as chronic bronchitis. Several viruses cause bronchitis, including influenza A and B. Contact with chemical fumes, dust and vapours from specific jobs also increase the risk for the condition. If the cause of the bronchitis is bacterial, it can be contagious. If the cause of the bronchitis is due to smoking, air pollution, or other inhaled irritants, it is not contagious. Infections, air pollution, and allergies can worsen the symptoms of chronic bronchitis, especially if a person smokes. Click on Below Video: How does Smoking Cause Chronic Bronchitis? Check Patient’s history of infection, a type of cough is noted with a history of smoking or any other exposure as air pollution or occupational. 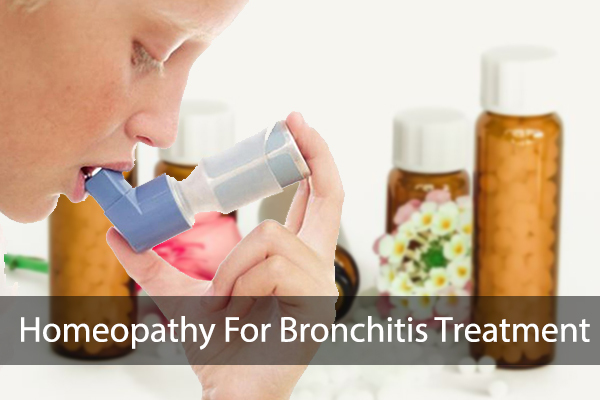 Homeopathy for bronchitis is one of the most popular holistic systems of medicine and gives an excellent result in all stages and all types of bronchitis. The selection of medicine is based upon the theory of individualization and symptoms similarity. This is the only way through which a state of complete health can be recovered by removing all sign and symptoms from which a patient is suffering. In cases of Acute Bronchitis, the duration of illness is decreased to a great extent, and the need for resorting to antibiotics is overcome. Toxicity to the patient is less with homeopathic treatment. In Chronic Bronchitis, homeopathy brings about long lasting relief by boosting the patient immune system to fight against the triggering allergens and controls the underlying tendencies to catch a cold quickly. At CHHC we have best medicines like Ipecac and Antim tart to give relief from the productive coughing episodes instantly. Deep acting intercurrent medicines like Silicea and Tuberculinum help in lowering the tendencies to catch the infection repeatedly and give an immunity boost to the patient. Since these medicines are safe and side effects free, they are suited for all age groups without the fear of any toxicity. Homeopathy for bronchitis treatment clears up the infection, relieves inflammation of the air passages, discomfort, pain and pressure caused by opens the airways in your lungs and help in loosening the bronchial secretions making elimination of mucus easier thus enabling each sufferer to breathe better and in a natural way. In homeopathy treatment the approach to treat the whole person and not only the presenting symptoms of the disease. Thus, rather than treating disease therapeutically, knowing a person’s constitutional type helps the homeopathist to choose the most appropriate medicine. While the homeopathic medicines listed below are generally used for best results, the individual should consult “Cosmic Homeo Healing Centre“. Homeopathy is often helpful to fortify one’s natural healing mechanism for gout and other diseases. In conjunction with taking the appropriate homeopathic medicine, it is necessary to maintain a diet low in purines to manage this condition. To know more about homeopathy send an enquiry to our Baroda clinic. Homeopathic treatment offers a holistic approach to the treatment of the gout disease and to boost the immunity of the human being, so that the disease does not recur, provided the patient follows a proper diet. 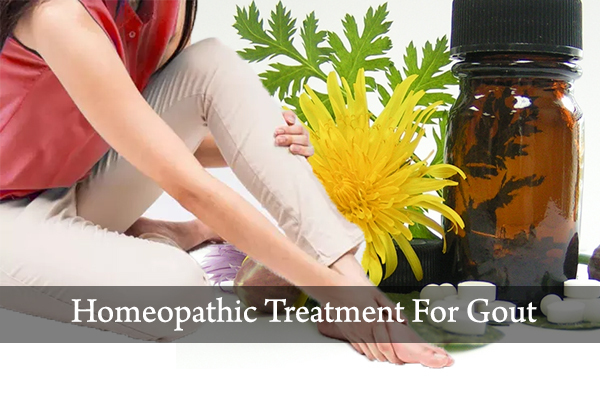 Homeopathic treatment for gout is faster and more reliable than any other system of medicine. It has no side effects. Different symptoms of the disease are treated with different homeopathic medicines in homeopathic treatment for Gout depending on physical, mental and general make-up of the individual. It affects men between the ages of 40 and 50 but can occur in younger men. About 90% of the men suffer from gout problem. Women are usually protected because of female hormones and tend to develop gout after menopause. Gout in the big toe or heel so painful that the person cannot bear to have it moved or touched. Joints are hot, red and swollen. The pain is worse in the evening and at night. Pains are worse in cold, damp weather and flare-ups may occur with changes in weather. This medicine is beneficial when the gouty pains shoot through the foot, limb and joints – especially the small joints. The foot and ankle are extremely swollen. Ice cube gives relieve to the pain and swelling. This medicine helps in homeopathic treatment for Gout to eliminate uric acid from the body in patients who tend to form gout recurrently. This medicine is used for treating gout where offensive urine is experienced. The urine becomes very offensive with a powerful odor, which can be detected from a distance. The odor is repulsive and the color of the urine is brown. More pain is experienced in the big toe and the knees are swollen. This medicine is indicated when there are sudden twinges of pain stitching pains in gouty joints, which are worse for motion. The pains often radiate out from the affected part and moves to different area altogether. Maintain a diet low in purines. Purine-rich foods to avoid include anchovies; herring; mackerel; shellfish; asparagus; meat gravies and broths; scallops; peanuts; mussels; mushrooms; sardines; baker’s and brewer’s yeast; mincemeat and sweetbreads; organ meats; red meat; goose and duck. Limit intake of cauliflower, dried beans, caffeine, lentils, peas, and spinach, oatmeal and yeast products. Consume plenty of water as this promotes the excretion of uric acid and prevents the development of kidney stones. Drink cherry juice as it prevents uric acid crystals from forming. Cherries, strawberries and Blueberries neutralize uric acid and have antioxidant properties so eat more of them. Enjoy foods such as fruit, rice, millet, green vegetables, corn, cornbread, eggs and herbal teas. Avoid alcohol as it may provoke acute attacks. The diet of gout should be high in complex carbohydrates and low in protein. Psoriasis is an obstinate skin disease in which red patches of various sizes occur on the skin that is covered with dry, silvery scales. Psoriasis is a chronic skin disorder that got its name from the Greek word meaning, ‘itch’. For a majority of psoriatic individuals, the itch is the most unpleasant aspect. Other equally aggravating symptoms include burning, hurting and stinging. In psoriasis the skin becomes inflamed and red eruptions appear on the skin surface that begins to itch excessively. Those areas form thickened areas that are covered with silvery scales over the reddened lesions. The skin at the joints may crack. Psoriasis affects the growth cycle of the skin cells, leading to a build-up of thin layers of cells which multiply without waiting for previous cells to shed. The outcome is the original psoriatic appearance ugly skin patches with scaling. 2. The lesions are cover with silvery scales. 3. Itching is a common feature. There may be burning after scratching. 5. The lesions are dry or, excessive dryness may cause cracked skin and bleed. 6. Swelling and stiffness of joints, when there is joint involvement. Psoriasis is categorized as mild, moderate, or severe, depending on the percentage of the body surface involved and impact on the patient’s quality of life. 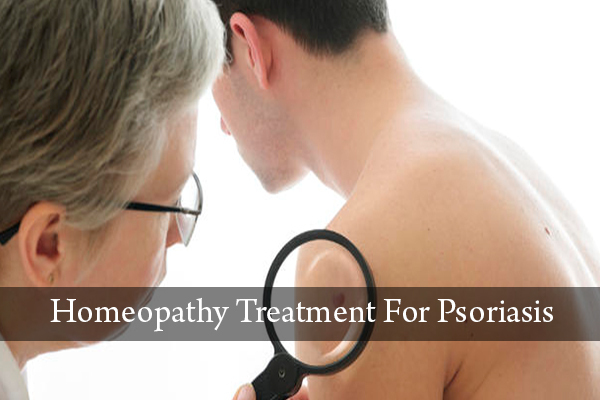 Homeopathy treatment for psoriasis is the best method to treat skin diseases from the inside out. It requires selecting a specific homeopathic remedy that addresses the whole person and restores the body to harmonious balance. Apart from treating the health issue, homeopathy treats the expressive outer symptom, such as psoriasis. Homeopathy understands that a skin eruption such as psoriasis is mostly an external manifestation of a situation where the body’s immune system is waging a battle, and doing a pretty good job of pushing the threat away from major organs such as the lungs, joints, heart, brain, and eventually out of the body. An embattled skin surface looks anything but aesthetic or healthy. The main thing is that the body has protected itself, although it has not yet solved the problem entirely. It needs more time to cure this problem. The trouble is that we hardly allow our body the time it needs to handle things on its own. We meddle with its natural attempt to drive out the problem from inside. Homeopathy does stimulate and strengthen the body’s own inner workings and immune system towards driving the aberration right out of body not just from the surface. The homeopathic medicines for psoriasis address the body at the level of immunity and gently restore the deviation back to normalcy. It helps to control the further progress of the psoriasis disease. Hair Fall can be defined as loss of hair in excess than the normal or failure of the Hair follicles in the scalp to grow new hair leading to the development of baldness gradually. Hair fall is a common problem in both men and women. Millions of people are suffering from Hair fall problem, and when they think about how to control it, they get into the depression. Nowadays Hair fall, areata, Alopecia, premature greying, dandruff, brittleness, split ends, dry scalp is becoming major hair problems. 1. Hair is far more than it appears. 2. Most people have about 1, 00,000 Hairs on the scalp. 3. Scalp Hair grows in cycles and has different phases, and every strand of Hairs experiences through various phases before falling out like a stage of growth, stagnation and ending with Hair fall. 4. Some amount of Hair is fallen and is around 50-100 strands per day is normal. Homeopathy is gaining worldwide recognition as a powerful and natural way to slow down hair fall. It has many different causes such as age, illness, genetics and medications may all play a role. No matter what’s causing your hair to thin, there is the homeopathic treatment which helps you to slow down hair fall, stimulate the scalp and promote new hair growth. Anagen is the active growth stage of hair follicles during which the root part of the hair is dividing rapidly, adding to the hair shaft. During this phase, the hair grows about 1 cm in every 28 days. Scalp hair stays in the active phase of growth for 2–8 years; this period is genetically determined. At the end of this phase, an unknown signal causes the follicle to go into the catagen phase. The catagen phase is a transition stage that occurs at the end of the anagen phase. It indicates that it is the end of the active hair growth. This phase lasts for 2–3 weeks while the hair changes to a club hair. A club hair is formed during this phase when the part of the hair follicle in contact with the lower part of the hair becomes attached to the hair shaft. The process cuts the hair off from its blood supply and from the cells that produce hair. When a club hair is fully formed, about a 2-week process, the hair follicle enters the telogen phase. The telogen phase is the resting of the hair follicle. When the body is subjected to extreme stress, as much as 60-70 percent of hair can prematurely enter the telogen phase and begin to fall, causing a noticeable loss of hair. This condition is called telogen effluvium. The club hair is the final product of a hair follicle in this stage and is a dead, fully keratinized hair. 50-100 hair is shed daily from a healthy scalp. Hair fall problem occurs when the growth cycle of the follicle is disrupted – triggered by genetic predisposition coupled with physical or emotional damage. The follicle begins to shrink, producing thinner and thinner hair day by day. Eventually, the hair falls out and does not grow back. 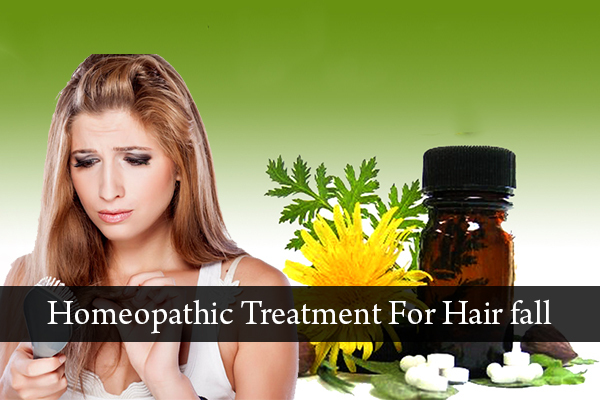 Homeopathic treatment has a good scope and can aid regrowth of hair and Stop your hair fall problems. Homeopathic medicines stimulate the hair roots to promote regrowth. The Homeopathy medicines used to aid hair regrowth are all of the natural elements, and therefore, it is safe for use among all age groups. The best part of Homeopathic medicine is the absence of any related toxic side effects. As Hair fall is a multifactorial and is affected by a large number of factors and each individual’s Hair and Hair follicle are different and so same techniques, and same treatment for all the persons with Hair fall does not work. Unnatural hair fall indicates some underlying condition which needs to be balanced in body healing mechanisms at the physical and mental levels. At CHHC treatment is based on individualization. Every individual with Hair fall is studied in depth, and proper analyzation is done to find the root cause and targeted to rectify the fault at root cause level to strengthen the Hair with the minimum reduction of hair fall and regain healthy Hair growth. 1. Highly indicated medicine like Thallium, Carbo veg are helpful in correcting the hair fall after a debilitating illness. 2. Underlying conditions like dermatitis and dandruff are covered well with Sanicula and Mezereum. 3. Use of intercurrent, deep acting medicines is done to tackle the genetic tendencies and to improve the balance in the body. Homeopathy is a system of natural remedy based upon the Ancient Principle of “like cures like” which is popular for the treatment of chronic disease of all types such as skin disease, Bones & joint disease, Kidney-Bladder-Prostrate disease, Psoriasis and others. It is popular for the treatment of acute diseases such as colds and flues, throat and lung infections, pains, aches, dysentery, injuries, diarrhea and many more. It is not usually indicated for critical diseases such as severe infections such as malaria, tuberculosis, pneumonia, heart or kidney failures, accidents, etc. Who Gets Benefits from Homeopathy Treatments the Most? Homeopathy is very safe, effective and fast acting. Its medicine is fast acting, restoring optimal health. It is useful in both conditions of acute and chronic diseases. Especially for those diseases which keep on appearing after few days, months and years. Homeopathic medicines are prepared from small amounts of proven healing substances derived mainly from plants, minerals and animals. The effectiveness of homeopathy in recurring diseases such as a migraine, allergies, arthritis, asthma, acne, autism, rheumatism, psoriasis, etc. is a hallmark of homeopathy. Homeopathic medicines will not hamper digestion; will not lower immune resistance, will not produce any allergic reactions and are safe in the long term if taken as directed by qualified homeopathy. 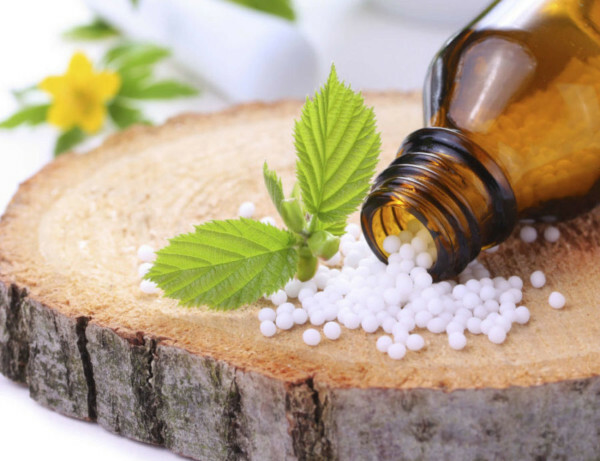 The advantage of homeopathy is in a fact that the relief offered by it in the treatment of chronic diseases is long lasting for many months or years. The lasting relief is achieved because homeopathy treats the diseases from the root. The main approach in homeopathy is such that it addresses the patient’s physical, disease, emotional and genetic totality; and treats the disease traits rather than treating diseases superficially. Depending on the nature of the conditions and its cause, the cure achieved by homeopathy may last for a very long time. Homeopathy is a safe system of medicine, free from any adverse side effects. If used correctly there will be signs that the medicine is working, which result in symptom improvement. The format of the medicine is such that the medicines are devoid of any toxic substance, hence totally harmless. Homeopathy is safe for all ages and especially for newborn babies, pregnant women, menopause period and elderly patients. 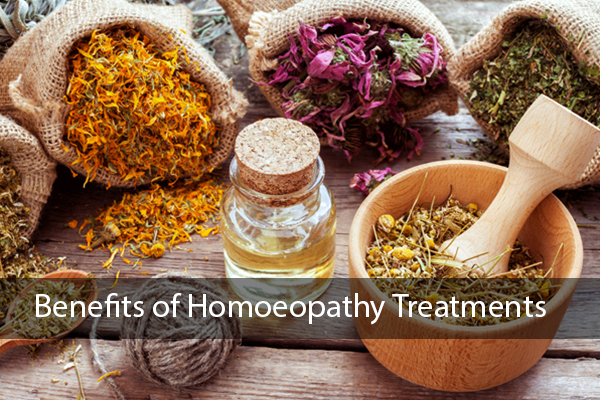 Other benefits of homeopathy treatments which include its cost-effectiveness, easy to take, child-friendliness and it can be used along with other forms of medications. Cosmic Homeo Healing Centre, located in Vadodara offering the varieties of services by using the right, natural ingredients and the results generated are simply mind-blowing. For more information contact us or book an appointment.